We’re all about safety and positive neck reinforcement from any chair we use to game in. This is why we love chairs like this Turismo Gaming Chair that were built in the typical racing style fashion. You’ve got the lumbar support pillows, you’ve got the neck pillows for added comfort and just for style, you’ve got the straps on the back of the chair that give it that race car feeling. The base of the chair was relatively shiny and that’s because of the base that was made with heavy metal and supports up to 350 pounds. 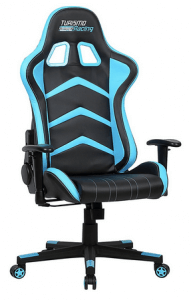 This is from a company called Turismo Racing and is making headways into the gaming chair community with products like the Turismo Racing Cagliari Series Gaming Chair. Q: What about the reclining position of the chair? How does it recline? Q: What about overweight and taller people? Will this chair fit them? With the wide base of the Turismo Racing chair, we were slightly worried about comfort because it had such a wide base. However, the overall foam cushion fabric was rather nice and the stitched leather exterior didn’t take away from any of that comfort. This comes in part due to a number of reasons but is mostly thanks to the ergonomic design. The extra base was built mostly to support larger people and to have maximum support overall. The design and materials used in the construction are rather solid. One of the best things we enjoyed were the free pillows included with this Turismo Gaming Chair which helped protect your back and your neck. This is important if you’re sitting for extended periods of time. There are two levels of memory foam for maximum comfort and support. The top layer is a 2 inch thick layer of high density foam. Underneath that is a 1 inch thick layer of comfort foam with pressure relief system. This makes it ideal at removing pressure points on the back of your legs that would impact your blood circulation. All of the foam has an open cell structure that pulls heat away from your body and distributes it throughout the interior of the chair, keeping you cool and sweat free. The design of the Turismo Gaming Chair is to allow for 12 plus hours of sitting without having any body fatigue or risk from blood clots due to poor circulation. The first thing we noticed about this Turismo Racing chair was the free pillows attached with the chair. A lumbar supporting pillow and a neck support pillow was a huge selling point as not a lot of chairs include these and we take support health seriously. The design is black ut has a lot of splashes of orange all around the chair at various places. First, there’s the base of the chair which has flaps that are painted orange and then there’s the headrest pillow which has the outer edges covered in orange. The flaps on the outside of the chair as well on the upper portion are orange which give it a nice stand out effect. We didn’t care too much for the barely visible orange stitched seams but the straps on the back of the chair were relatively nice to look at and gave it that racing chair feel. 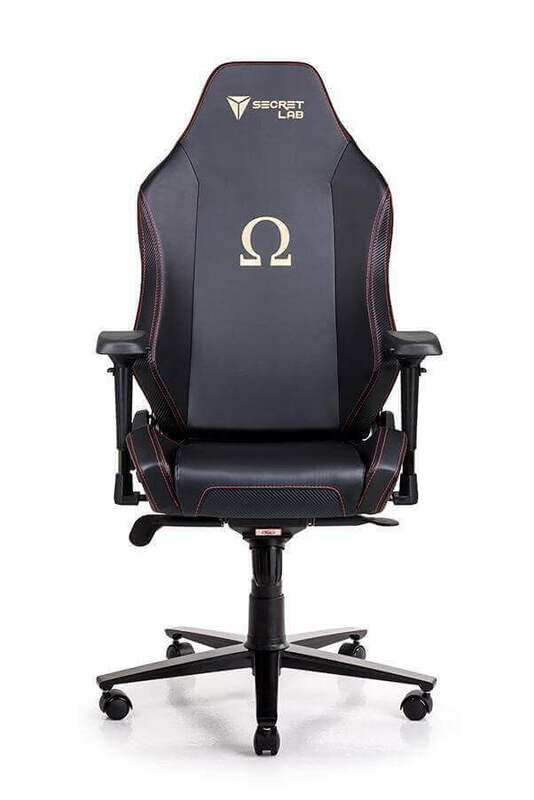 You can tilt down from upright gaming mode all the way down to 180° nap mode with an adjustable tension so you don't fall over when leaning back. On that note about stability, the wide five point base keeps a good center of gravity on the chair no matter how you are using it. And if you need to bend over or reach to grab something, you're not in danger of falling over. This Turismo Gaming Chair is very comfortable to relax in. The aluminum base also supports up to 350 pounds and while its aluminum, the base is spread out on the bottom well enough that it supports all kinds of different people. The base is also great because it spreads out to support not only larger people but spreads out the seating position and allows people to lean from side to side. The pillows add a little extra durability by taking some strain off of the base and we loved the added comfort of those pillows as well. The chair was made to withstand a lot of weight and a lot of heavy use all the time, so you won’t be disappointed if this chair is used for 8+ hours every single day. The frame is made out of industrial grade steel that will ensure that the chair lasts a long time. The outer material will give way much earlier than the frame ever will. The Design – One of the most unique things about the chair is easily the design. The orange outer edges of the chair stand out and we really loved the straps from the lumbar supporting pillow that goes up to the headrests where two additional holes are placed, directly below the headrest. The Support – With a base and a stronghold that seats up to 350 pounds, we were thoroughly impressed with the overall durability of the seat. The Pillows – Speaking of the pillows, there are two different pillows included for free in this package. First, you get an adjustable neck pillow and then you get a nice therapeutic back pillow which can be adjusted to your personal preferences. A feature that is both good and bad depending on who you ask is the lower portion of the backrest almost wrapping around your torso. This is a great design feature that keeps you in the right position at all times. It can be a downside to larger gamers as they might not fit in since it gets a bit narrow. Padded Armrests – If you don’t like the armrests, these rests can be adjusted or folded up as you desire. The armrests are also special soft to help you protect your shoulders and your wrists. They are 4 dimensional, so they can be raised and lowered and also tilted and extended out away from your sides if you need more room in the seat. A: This Turismo Gaming Chair reclines in a flat position as the base and the upper part of the chair aren’t separate. When you lean back, the entire chair will lean back but the position is still comfortable and this is easily adjusted to fit your preference. A: Easily. This Turismo Racing chair was made with not only a larger base but was made with extra strong aluminum so that the chair could support up to 350 pounds. You won’t have to worry about the base breaking. The Turismo Gaming Chair was made for a lot of different reasons and can be used in positions like your office or your gaming room. While the chair supports heavier people, it’s made for people of all sizes including large and small. The pillows that come with the chair are fully adjustable to your personal needs and are very comfortable. We found it hard to get out of the chair due to the PU foam cushion material and it was a reasonably priced chair. We can definitely recommend this Turismo Gaming Chair to any gamer or office worker.